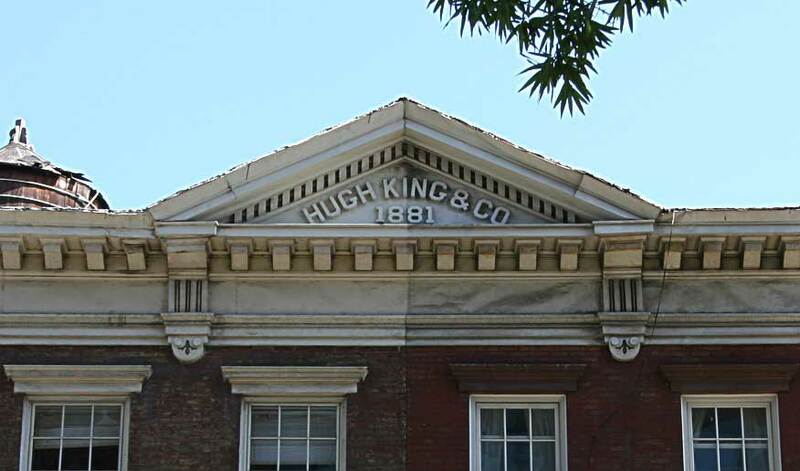 Hugh King & Co., 1881. Pediment at 630-632 Hudson St., New York. Hugh King (1845?-1929) was an immigrant from Ireland, who became a pioneer in the oil (petroleum) industry, competing with Standard Oil and such in Pennsylvania, Oklahoma and Mexico during the 1860s and later. His oil company, Columbia Oil Co., had refineries in Bayonne, NJ. These he sold in 1924 to Shell Oil. He was also in business in New York as a wholesale grocer from around 1867. He built this building in 1881 for his grocery business, which stayed here until 1901.